US 13 runs southwest to northeast through the eastern part of North Carolina. It begins at Interstate 95 near Fayetteville as a continuation of the Fayetteville Outer Loop and heads northeast, intersecting U.S. Route 421 in Spivey's Corner and Interstate 40 and U.S. Route 701 in Newton Grove. It then passes through the city of Goldsboro, where it intersects U.S. Route 70 and U.S. Route 117. US 13 continues northeast and shares a brief concurrency with U.S. Route 264 before passing through the city of Greenville. US 13 then heads north from Greenville, following the limited-access U.S. Route 64 east between Bethel and Williamston and U.S. Route 17 north between Williamston and Windsor. US 13 then heads north from Windsor towards the Virginia border and crosses U.S Route 158 in Gates. US 13 continues north, expanding to four lanes near Suffolk and diverges onto the Suffolk Bypass where it joins U.S. Route 58 and U.S Route 460. Here, one of the many business routes of US 13 passes straight through the city as the bypass passes the city to the west. 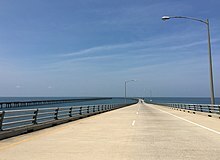 It continues through the Hampton Roads area on the Military Highway and continues north to the Chesapeake Bay Bridge–Tunnel, which the route uses to continue across the Chesapeake Bay to the Eastern Shore of Virginia. Here, US 13 is the main north–south route of the region, and connects to most cities and towns with four more business routes forming loops off the highway. North of New Church, US 13 crosses the state border into Maryland. US 13 passes through the lower Eastern Shore region of Maryland. It runs through Pocomoke City in Worcester County, where it meets the southern terminus of U.S. Route 113. It continues north into Somerset County, where it passes through the town of Princess Anne. It then enters Wicomico County, where it bypasses the city of Salisbury and the town of Fruitland to the east on the limited-access Salisbury Bypass with the former alignment signed as U.S. Route 13 Business. On the northeastern part of the bypass, US 13 is concurrent with U.S. Route 50, which bypasses Salisbury to the north. North of Salisbury, US 13 continues to the state line town of Delmar. US 13 runs through the entire north–south length of Delaware. It enters the state in Delmar and runs through western Sussex County, intersecting U.S. Route 9 in Laurel and passing through the city of Seaford. It continues into Kent County and heads north towards the state capital of Dover. US 13 forms the commercial district of the city of Dover. Between Dover and Wilmington in New Castle County, US 13 is paralleled by Delaware Route 1. It crosses the Chesapeake and Delaware Canal on the St. Georges Bridge. US 13 continues towards Wilmington, sharing a concurrency with U.S. Route 40 in the New Castle area. It bypasses the heart of Wilmington to the east, with U.S. Route 13 Business passing through the downtown area. US 13 parallels Interstate 495 between Wilmington and the Pennsylvania border. Upon entering the Commonwealth of Pennsylvania from Delaware, US 13 runs along the banks of the Delaware River parallel to Interstate 95 through Delaware County. It then runs a southwest to northeast path through the city of Philadelphia. It traverses West Philadelphia on many one-way pairs and then passes by the Philadelphia Zoo. US 13 then runs through North Philadelphia and Northeast Philadelphia by following Hunting Park Avenue, the Roosevelt Boulevard (which is also U.S. Route 1), and Frankford Avenue, where it crosses the oldest bridge in the United States. US 13 then enters Bucks County, again closely following I-95 and the Delaware River. It ends after an interchange with US 1 in Falls Township, just west of Morrisville. The original 1925 U.S. highway plan, which never came to fruition, had provision for a U.S. Route 13 in North Carolina. It would have started in Wilmington and run at least as far north as Elizabeth City, following what would become US 17. Although US 13 was signed in most northern states by the late 1920s, it would not reach North Carolina until the early 1950s. The route was proposed as one of the first four-laned highways in the United States of America to Pierre S. du Pont by John J. Raskob so as to run from Wilmington, Delaware to the State Capital, Dover. Du Pont wanted a two-laned highway—which were standard at the time, but Raskob suggested, with the growth and development of Northern Delaware, there will be a future need for a four-laned one. Du Pont agreed and, to honor Raskob for his insight, sought to name the route after him. However, Raskob declined. Du Pont checked with the U.S. registry of highways to see if any routes were named "13" and so named "Route 13" after the number of children John Raskob had. What was considered an "unlucky" number by most, instead honors the man whose idea for this route being four-laned from its very beginning. US 117 in Mar-Mac. The highways travel concurrently to Goldsboro. US 70 in Goldsboro. The highways travel concurrently through the city. US 258 north of Snow Hill. The highways travel concurrently to south-southwest of Farmville. US 64 north of Bethel. The highways travel concurrently to south-southeast of Williamston. US 17 south of Williamston. The highways travel concurrently to Windsor. US 158 northwest of Winton. The highways travel concurrently to northeast of Winton. US 58 in Suffolk. The highways travel concurrently to Chesapeake. US 460 in Suffolk. The highways travel concurrently to Chesapeake. I‑664 in Chesapeake. The highways travel concurrently for approximately 0.4 miles (0.64 km). US 50 in Salisbury. The highways travel concurrently through the city. US 40 in State Road. The highways travel concurrently to Wilmington Manor. US 1 in Philadelphia. The highways travel concurrently through the city. Wikimedia Commons has media related to U.S. Route 13.